Sometimes, when I'm lucky, I'll find both tasty and easy-to-make recipes in the New York Times. 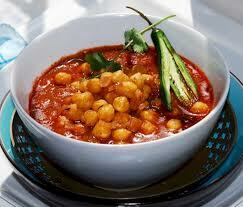 An oldie but a goodie was this: Channa Masala. Although the recipe calls for a heap of spices that I didn't currently have in my cabinet, and, seemingly, a lot of prep. steps, Channa Masala is remarkably easy to make. Crack cardamom pods, remove seeds, then crush and set aside. Chop dates and set aside. Add onions to oil, stirring until they are brown (7-8 min). Add garlic and let cook for about a minute before adding tomato paste then reduce heat. Add cardamom and all the remaining ingredients--minus the chickpeas--and saute for a couple of minutes. Add chickpeas and a half a cup of water-enough to make the contents "wet". **we used a regular yellow onion. ***we found that the longer the mixture simmered, the better the flavor of the dish, so, if you have the patience, then let it "stew" for, at least, 30-45 minutes. Looks pretty yummy. Hope it turned out well. It would be especially great tonight since we are getting another winter weather advisory. I am ready for spring. Take care. Yes, it's a hit. We're having a bit of a cold snap here---not compared to other places---so a huge pot of this would hit the spot! That sounds great - the only time I have used cardamon was in a cake recipe. Must give this a try. Yes, I had had cardamon in cake only prior to making channa. This recipe makes a tasty treat!